The Erkunt Group was established in 1953 in Turkey. The company was initially a casting and pattern shop. Erkunt has grown to employment 174 white collar and 851 blue collar workers, totalling 1025 in a 60,000 ton/year capacity complex that is the leader in Turkey for grey iron and nodular casting production and mechanical processing. For the past 20 years the company has increasingly been increasing exports to Europe. Production has grown to 60,000 tons per year. Erkunt exports %85 of total production of which 76% is machined, and 24% is raw castings. The companies products are produced to ISO/TS 16949 and the company registered to ISO 9001 and one of the largest independent casting and machining company in Europe. In 2003, the Erkunt Group started the tractor division with the establishment of Erkunt Tractor Ind. Inc. and became a member of OEM group. Tractor production started in September 2004. In the following 6 years, 8268 tractors were sold in domestic market through 73 dealers and 105 sales points. The company, which entered the market with only two models, is now able to offer potential customers in different countries almost 40 different models between 58 and 83 hp. At the end of year 2010, Erkunt's market share in Turkey is 18% and is the second biggest tractor manufacturer in Turkey. Erkunt distributes tractors under ArmaTrac brand in international markets and works on distributorship basis. Currently, Erkunt has distributors in Bulgaria, Hungary, Romania, Cyprus, Serbia, Greece, Austria, Finland, Portugal, Poland, Malta and Croatia in Europe as well as Morocco, Tanzania, Angola, Sudan, Yemen, Senegal and Mali in Africa; Barbuda and Antigua in America and Iraq in Asia. They have plans to grow and increase exports, including to the UK. 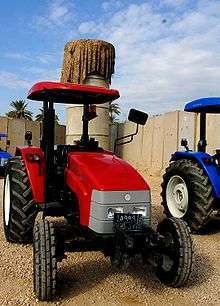 The tractors are designed by Turkish engineers, which is unusual in the Turkish tractor market, as most other manufacturers build them under license. The tractors are built to order. The tractors use ZF and Carraro transmissions built under license by them in Turkey. Perkins and Deutz manufacture the diesel engines. This article is issued from Wikipedia - version of the 2/6/2015. The text is available under the Creative Commons Attribution/Share Alike but additional terms may apply for the media files.